Emiko walks home from school and hears her mother and father arguing. She asks Robert where they are going and he tells her that she and her mom are moving somewhere else. She begs for him to stay, but he walks away. Emiko delivers papers to Dante's apartment. She attempts to steal his watch but he catches her and throws a knife near her. She tells him she needs money and asks how he what he did with the knife. He promises to teach her but also says he'll kill her if she tries to steal from him again. Emiko is scolded by Dante for not doing her best. She says she's busy working on something and he asks why she would rather choose a father who abandoned her over the Ninth Circle. He hands Emiko a gift. Emiko goes to dinner with Robert and gives him a business plan that shows she should be the CEO of Queen Consolidated. Robert tells her Oliver will be running the company. She asks if he ever cared about them, but Robert tells her he has to go. He asks if she had anything else she'd like to talk about, but she says no. Emiko has the news on that's reporting on the boat crash that Oliver and Robert were on. She has a blueprint of the boat and throws it in the garbage. Oliver and Emiko train together. Oliver tries to ask her about her past, but she is vague with her answers. Later that night, Emiko spots someone spying on her and she shoots an arrow at them, which grazes past their shoulder. The person turns out to be Laurel. Felicity is visited by Alena who informs her she's working at a Tech Villiage in order to keep a low profile. She tells Alena about the Archer Program and asks Alena to be the CTO of Smoak Technology, which she happily accepts. Laurel visits Felicity but Oliver's the only one home. Oliver offers her a bandage for her arrow wound and she informs him that it was Emiko who gave it to her. She also tells him that Emiko's the one who killed Diaz and that she has no records from before she was 15. Oliver doubts Laurel's information and intensions, and Laurel agrees to stay out of it from now on. Oliver tracks Emiko down at Palmer Technologies where she's working with a gang of criminals. Oliver attempts to stop them but is too late and Dante blows up the building. A doctor tells Oliver he needs to stop the Ninth Circle. Team Arrow meets up at the bunker and goes over what they know about Dante and the Ninth Circle. Oliver tells them about what Laurel said about Emiko. The team plans to find the Ninth Circle and stop them from using the eight military drones they stole. Laurel's been summoned by Dinah who accuses her of bending the rules to put guys behind bars. She tells Laurel she has one more chance with a criminal named Hernandez, but she has to do it the legal way. Oliver stops by Emiko's place and asks about her training partner. When she doesn't answer he tells her he saw her with Dante the night before. She tells him that Dante took her under his wing after Robert abandoned them. She says she owes him and has to pay her debts. She tells Oliver he can't help her. Diggle brings Felicity a Dante's DNA sample that Lyla procured from ARGUS and Felicity is able to track him down. Team Arrow stops Dante's team from stealing and he blames Emiko for it. His men try to grab her but Team Arrow manages to chase them off. Emiko tells Team Arrow that Dante's looking for uranium. When she steps away, Diggle warns Oliver to be careful with her. Emiko tells Rene that she didn't want him to get mixed up with the Ninth Circle, but she wishes she told them the truth. Dinah tells Laurel it's time for her to do her job. Laurel goes to offer Hernandez a deal to get his boss. Hernandez mentions Quentin and Laurel loses her cool and threatens his life before Dinah takes her away. Oliver finds a jammer in the bunker and goes to tell Emiko, but she points an arrow at him. He's able to stop her, and she admits she never stopped working for the Ninth Circle. Oliver is hesitant to hurt her and she manages to escape the bunker. Felicity and Diggle try to get Oliver to take a break, but he is determined to find Dante and Emiko. Dinah informs Laurel that Hernandez was found dead after Laurel said he had to be let go because of bail. Dinah accuses Laurel of killing him. She says the look Laurel gave him was the same look she gave Vinny before she killed him. Laurel says she will always be seen as the Black Siren in Dinah's eyes. Dante tells Emiko now that she's taken care of her mother's killer, she can go back to her original mission. Diggle asks Oliver if he wants to talk and reminds Oliver that he's went through the same thing with his brother Andy. Oliver admits he feels so much guilt about what his family did to her. Oliver says he hopes to redeem her and maybe it could also redeem his family. Team Arrow finds Dante's location and goes to take out the drones. Dante runs away after escaping Diggle and Emiko takes out Rene. Oliver manages to take out seven drowns, but is distracted by Emiko who orders her men to kill him and he's unable to get the eighth. 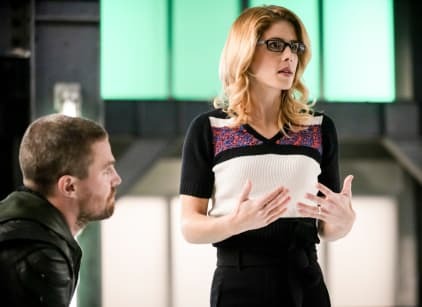 Felicity tells Team Arrow that the Ninth Circle used the remaining drone to bomb abandoned buildings. Emiko visits Laurel and tells her she told the media that Laurel killed the criminal. She says she thought she was punishing Laurel but perhaps she was actually setting her free. Alena updates Felicity on the progress she's made with Archer and that they are going to have to start hacking police records in order to get DNA from people they don't have any from. Oliver looks over the cameras and Diggle asks if he's still trying to redeem Emiko, but Oliver says he's trying to stop her before it's too late. Emiko puts a knife to Dante's throat and says he disobeyed a direct order. Dante tells Emiko she needs to be a better leader to the Ninth Circle. She tells him that she knows something even bigger than they anticipated, the Archer program. She tells Dante she will kill him if he questions her authority again. Emiko: And you make me sad. Trying so hard to become someone you're not, and for what? So that the city will take you seriously as a hero? That is almost as ridiculous as you wanting to be one. Laurel: Geth the hell out of my office. Now! Emiko: I thought I was punishing you for following me, but maybe I just set you free. Permalink: I thought I was punishing you for following me, but maybe I just set you free. If I abandon her now, I'm no better than my father. If I can help redeem her, selfishly I feel like I will redeem my family just a little.